Wetcasting, which you might know as wetdashing or harling, is similar in technique to roughcasting (the stones are thrown onto the wall with a harling trowel). The difference is the aggregate is mixed into a silicone base through coloured cement slurry: making the process ‘wet’. This particular method is one of the hardest, weather-resistant exterior render finishes we offer. 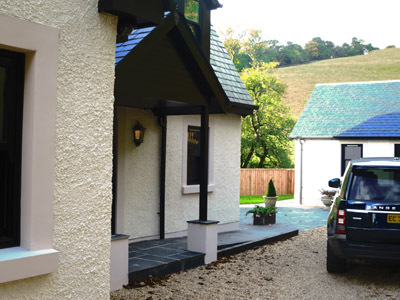 Given its tough properties, it’s a favoured choice as a traditional exterior finish in rural and coastal locations throughout Scotland. Wetcasting is commonly used in renovating and restoring period properties and listed buildings. Coupled with traditional construction methods and specialist techniques, we can restore your building back to its former glory. Our system comes in 30 standard colours and sample boards can be made up on request, as with any other render, to help allow the client to make the very best choice for their project.